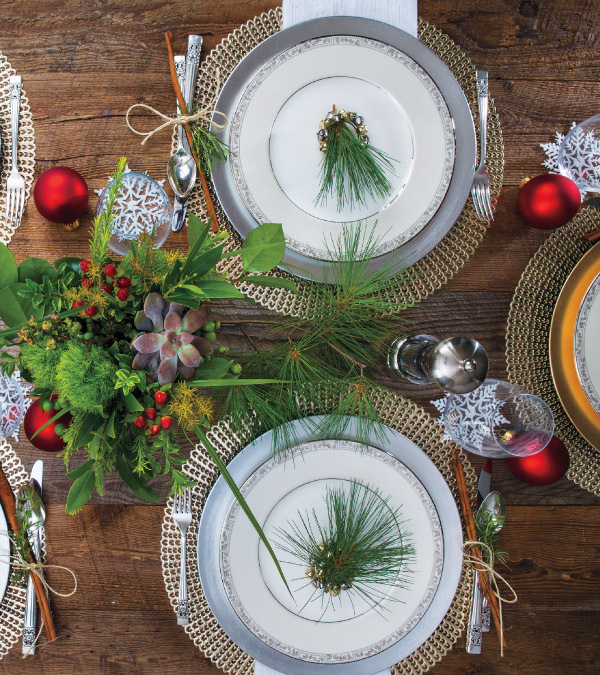 Setting your table with Christmas-themed décor is a custom that helps create the perfect atmosphere to enjoy a holiday meal with family and friends. If you’re looking to change it up this year, try taking a new route and show off a contemporary table setting with natural components and distinct color choices. Here are some inspirational DIY ideas to spark your creativity. Choosing your color scheme is an important part of setting the tone for your holiday. Stay away from using too many traditional colors and use gold, silver, navy blue, purple or gray throughout your décor. The rich tones of purple and navy blue are warm and inviting and produce a winter disposition. Gray is a simple, yet excellent color choice that will highlight any natural items you bring to the table. Your centerpiece doesn’t have to be conventional. Create a floral arrangement including fresh red hypericum berry, succulent, bay leaf, Camellia leaf, Chinaberry, raspberry, honey bracelet, green dream dianthus, leptospermum pods, oregonia and/or local star grass in your favorite vase. Each of these natural elements can be used in other ways across the table.